When a product is labelled as ‘limited edition’ the public’s growing need and interest seem to expand – making it available in select places or quantities is marketing tactics 101. It works particularly in the realms of fashion, niche streetwear brands such as Supreme and sneaker stores benefit from this modus operandi – supply and demand at its finest. Now it looks like food and beverage manufacturers are borrowing from this model by making extremely limited products of their own. The latest example happens to come from Cadbury, who’ve come up with the Caramel Twirl bar – and to quote the expletives of my favourite chef-turned-rapper Action Bronson: ‘F*ck that’s delicious’. Like the delicious #smooth taste of Caramel or Cadbury Dairy Milk? Why not mix things up with #creamy Oreo or surprising Jelly Popping Candy! Take a new Cadbury Dairy Milk chunk out for a spin. What do you feel like? The limited edition bar resembles a normal looking Twirl, yet the middle doesn’t have a gooey goodness nor are the twirls in the chocolate made of caramel. Instead, the caramel feature is cleverly disguised within the actual bar, as a caramel-flavoured milk chocolate coating. Pure genius from Cadbury! 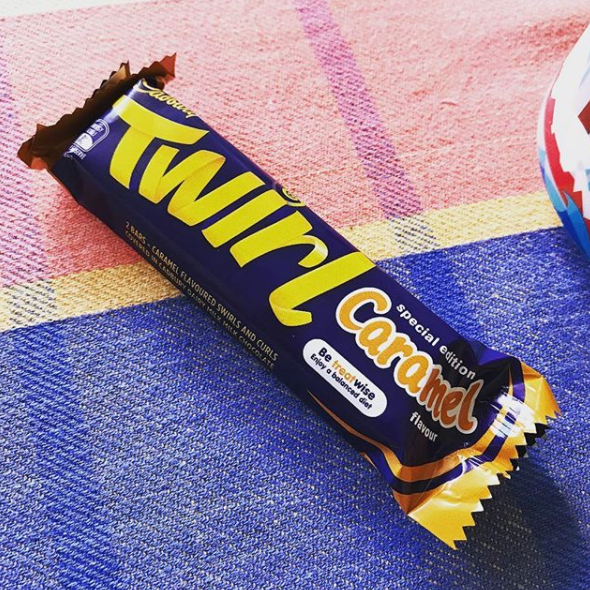 However, before you go running to your local shop to give them your hard earned cash, we’ve got some heartbreaking news for you – unless you happen to live Down Under – the Caramel Twist Bars are only available in Australia. I know right? Life is so unfair! Not only does Australia have better weather, beaches and Krispy Kreme flavoured milkshakes, they also get to have this Caramel Twirl joy all to themselves. Try not to despair too much though, if you are after a limited edition chocolate bar, the guys at Nestle have your back, as they’re officially bringing back their one-of-a-kind tubes of orange Smarties. Orange Smarties are so popular we simply had to bring them back this season. People love their distinctive flavour and they are our number one consumer request. The giant tubes launched last autumn. We’re sold out in some stores within a few weeks from the launch and we’ve been inundated with requests from people all over the country asking us whether they could still get hold of some. Orange Smarties are slightly more difficult to manufacture in high volume, given the different process and recipe required to get that orange-y taste but our experts have been hard at work to make it happen and we are really pleased that we can offer them again this spring. 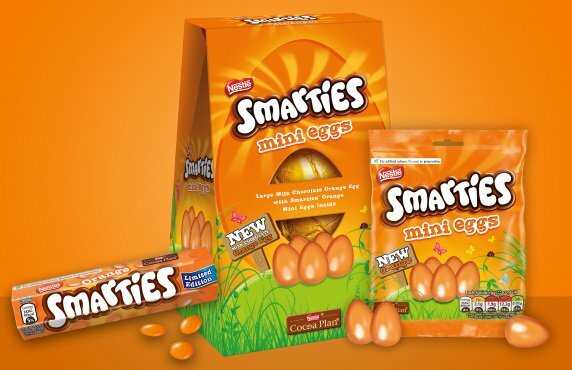 Furthermore, Nestle have released a special Easter edition of the orange Smarties, which is available throughout the UK and Ireland. For the white chocolate lovers out there (i.e. me), Galaxy have released their own version this month – but like all good things in this world, it’s not available for the Brits. Surely there must be a way we can blame Brexit on this one?